Overall, Alexander and the Terrible, Horrible, No Good Very Bad Day is a good way to entertain your young ones for an hour and a half. We've all had one of those "Murphy's law" kind of days – anything that can go wrong, will. For Alexander Cooper it seems every day is like that and the day before his 12th birthday is no exception. He wakes up to find everyone in his grade has been invited to the cool kid's party the same day as his, then he trips in front of the pretty girl he likes and finally, sets the science lab and her notes on fire. Adding insult to injury, the rest of his family tends to have really good days which they like to discuss at the dinner table. Let's face it, Alexander is the "black sheep" dork of his family and can't seem to catch a break. However, all of that changes when he makes a birthday wish and hopes his family has a really bad day. Suddenly, on his 12th birthday everything goes right for Alexander and very wrong for his parents and three siblings. Based on the popular children's book Alexander and the Terrible, Horrible, no good, very bad day by Judith Viorst, the movie of the same name is out now on Blu-ray. Rated PG, it is a fun, family-centered film that children and adults will enjoy. With a good cast, including Steve Carell (The Office, Despicable Me) as Ben Cooper and Jennifer Garner (The Odd Life of Timothy Green, Alias) as his wife, Kelly, Alexander has some solid acting moments. Ben Cooper is right up Carell's alley and he plays it with his usual comedic charm. Garner reminds me of her character as the mother in The Odd Life of Timothy Green- a familiar, warm, caring woman who tries to "keep it all together". Ed OxenBould (Paper Planes) is the young, Australian actor who tackles the role of Alexander beautifully. My only criticism of him is that his speech patterns are a little off which can get annoying. Dylan Minnette (Scandal) and Kerris Dorsey(Ray Donovan) round out the group as Alexander's older siblings also caught up in his nightmare of a wish. While the movie is cute, it is far from innovative or original. Of course the plot offers the usual moral lesson and has a happy ending. The directing is fine but not unique in anyway. At only an 81 minute running time, the film is a little short but making it any longer would drag it out unnecessarily. The video is presented in 1080p High Definition, which makes everything crisp and sharp, and the colors vibrant. The audio is 5.1 DTS-HDMA but frankly there isn't much worth listening to that can't be done in basic audio. The Blu-ray extras offer some interesting segments including and interview with author Voirst and her son, the real life Alexander. 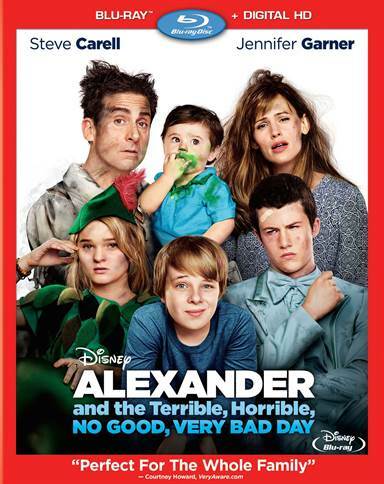 Download Alexander and the Terrible, Horrible, No Good, Very Bad Day from the iTunes Store in Digial HD. For more information about Alexander and the Terrible, Horrible, No Good, Very Bad Day visit the FlickDirect Movie Database.